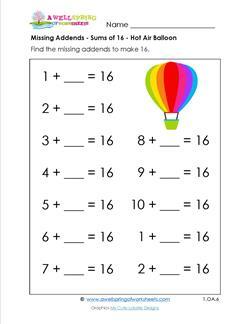 The first grade addition worksheets in this section include missing addend worksheets for sums of 11-20 at this time. Each section has 30 worksheets with various graphics themes that are sure to put a smile on kids faces. Each sum has a set of 6 worksheets with 12, 15, 24 or 30 problems per page for the various levels of learners in your class. Great practice to reinforce those addition facts. Look for more addition worksheets for first grade in the future!